During the next few days hopefully you'll spot some awareness raising by Jo's Cervical Cancer Trust as part of Cervical Cancer Prevention Week and our annual campaign #SmearForSmear. We are urging as many people as possible to get involved by putting up our posters or supporting us on social media. Cervical Cancer Prevention Week (21 to 27 January 2019) also provides an excellent opportunity for national action to tackle declining screening attendance. The annual cervical screening programme report was out a little while ago. In line with figures from Scotland and Wales, we saw attendance in England fall once again across all age groups. We are at an all time low in attendance with over 1.2 million women not taking up their invitation in 2017 to 2018. Sadly, we are also seeing rates of cervical cancer going up. Coverage is now at just 71.4% with every local authority below the national standard of 80% coverage. With the move to human papillomavirus (HPV) primary screening over the next 12 months this is a period of adjustment and upheaval. Competing priorities and resources remain a challenge. If we do not take time to address the barriers to uptake now, it will only continue to fall. The physical, psychological and financial impacts of cancer cannot be underestimated. All of us working in screening have a shared goal of reducing these impacts. Ensuring every woman has the information they need to make fully informed decisions about cervical screening is at the heart of this. 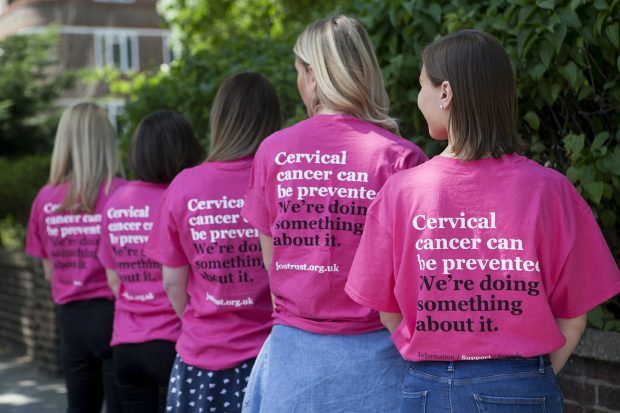 At Jo’s Cervical Cancer Trust we are working tirelessly to do this through campaigns like Cervical Cancer Prevention Week, information and outreach and we know you are working to do the same. Through our policy work we are calling for national action. This includes increased support and resources for more screening at sexual health services and for a new end-to-end IT system which will allow for innovation such as self-sampling in screening. We hear of so much excellent work happening across the country and it is only through sustained effort that we will overcome barriers to attendance. I feel that removing barriers to cervical screening goes hand in hand with supporting choice. 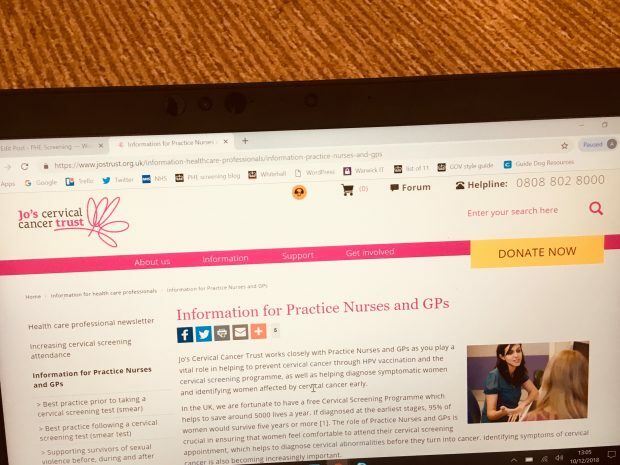 Jo's Cervical Cancer Trust works closely with the cervical screening programme, often providing vital patient experience and contributing to projects including developing a new data dashboard in collaboration with NHS Digital. This tool offers detailed quarterly coverage data enabling GPs and health organisations to assess where to focus attention and to evaluate the impact of activity. Our research provides a vast amount of data about awareness of cervical cancer and prevention among different groups of women. This includes women at the first age of invitation, women over 50, women who have experienced sexual violence and women from different minority ethnic groups. We also have ideas and guidance to reduce barriers to screening. This includes detailed case studies from GP surgeries, local authorities and Clinical Commissioning Groups (CCGs) and insight from our Spotlight reports collating work happening at a local level. We provide free, peer reviewed resources spanning all aspects of HPV, cervical screening and cervical cancer. They include posters, factsheets and an easy read guide. Our resources in languages other than English help explain cervical screening and we have films in languages including Urdu, Polish and Bengali. Through BrowseAloud our website can be translated widely. We publish regular blogs articles providing tips and information for specific barriers to cervical screening through our ‘Let’s talk about it…’ series. This includes female genital mutilation (FGM), pain and anxiety. We have best practice guidance for nurses and GPs (see photo below) for before and after screening to ensure the experience is as acceptable as possible for women. We also offer information about cervical screening for survivors of sexual violence. We provide free online and face-to-face support for anyone who needs us, including women or patients who are confused, anxious or are dealing with a diagnosis. Calls to our helpline about HPV are on the increase and will be the focus of our second blog article in this series. This is the first of 3 planned blogs by Rob Music, chief executive of Jo’s Cervical Cancer Trust. Please keep an eye out for future posts.